Home / Gossip / news / politics / Ifa Priest Claims - Any Man Who Sleeps With Ooni's Ex-Queen Without Cleansing Will Die! Ifa Priest Claims - Any Man Who Sleeps With Ooni's Ex-Queen Without Cleansing Will Die! Some people will call this superstitious but is this for real? In this age? hmmm. In the wake of the breakup of Ooni of Ife, Oba Adeyeye Enitan Ogunwusi, Ojaja II, and his former wife, Olori Wuraola, which expectedly created shockwaves and reverberated around the world, more salacious details have since emerged. Information gathered suggest that both parties, prior to being joined in matrimony, were divorcees, who had been involved in failed marriages. Sunday Sun gathered that the ex-Olori Wuruola, who has reverted to her maiden name, Zaynab Otiti-Obanor, following the breakup, had been married twice, thereby making her failed marriage to Ooni the third marital union that crashed. On his part, the Ooni had been garlanded with the medals of two failed marriages before his latest (and third) broken union. In the face of the serial divorce now associated with both the Ooni and his ex-queen, a serious twist has been added to the tale as an expert on Yoruba culture and renowned Ifa priest, Chief Yemi Elebuibon has revealed that ex-Olori Wuraola, must necessarily undergo appropriate traditional cleansing process to enable her to regain normal life. “For the woman, she might not really have a problem but for any man who sleeps with a queen or marries an ex-queen without the appropriate cleansing, the man may die prematurely, he may be struck with sickness or there might be retrogression in his life.” “Any marriage she would be going into must not be elaborate. They should go far away and avoid any flamboyant wedding,” Elebuibon warned. 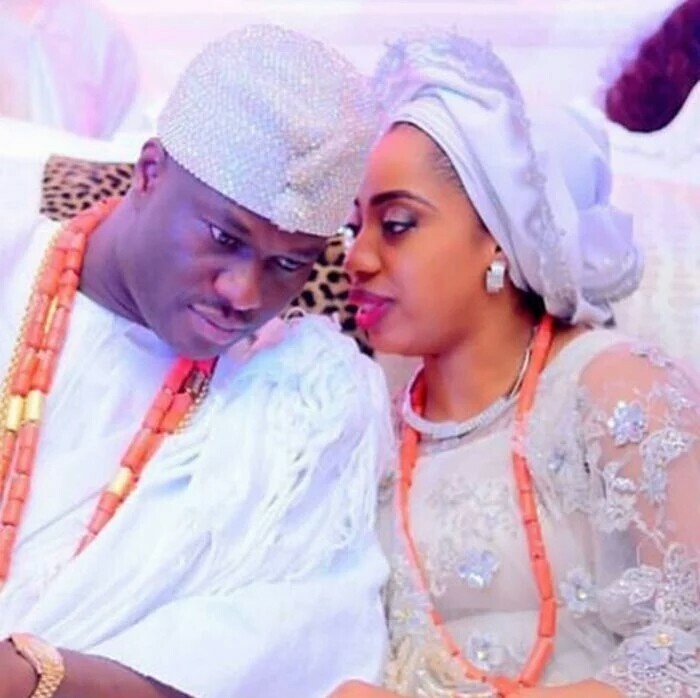 The news of the breakup between the Ooni and the ex-Olori, confirmed stories that had been circulating for months on blogs, social media and some magazines, to the effect that the marriage was troubled. But, last Wednesday, Olori Wuraola Zynab Ogunwusi, released an official statement on her Instagram page to confirm that her 17-month marriage to the one of the most revered monarchs in Yoruba land had broken down irretrievably and was officially over. Although, Oba Adeyeye Enitan Ogunwusi, has not issued a statement, it is glaring that the once fairytale marriage has finally packed up. The collapse of the marriage can be traced to the very beginning. Some people believe that one of the reasons the marriage failed was because Ooni made a hasty decision to get married to the ex-Olori, while others opined that the breakup happened because they didn’t court for long. Ooni was an eligible bachelor when he came to the throne and as the tradition demanded, he needed a wife and so he was introduced to Wuraola. As at that time, there were speculations that Wuraola was married to a Lebanese businessman but when the Ooni became serious that he wanted Olori Wuraola as a wife, she left the Lebanese to become the queen of Ife. Many reports alleged that the Ooni was advised by many well respected Nigerians not to marry her. The former president, Olusegun Obasanjo was also mentioned as one of the well respected Nigerians who told the Ooni not to marry the former Olori but he refused. There are also reports that Olori Wuraola had earlier been married to a former governor. Another reason given, for the breakup was that the former Olori expected so much from the Ooni and when the expectations were not met, a friction began developing in their relationship. The Ooni on his part was said to have started to doubt her loyalty to him. It was claimed that there was an issue of text messages found on her phone. Also, there was an instance when she travelled abroad without her being accompanied and so many other sundry issues that made the Oba say he was no longer interested. However, there are also speculations that the ex-Olori left because she was aware that Ooni wanted to take more wives and, according to sources, this didn’t sit well with her. The ex-Olori once spoke at the Emerging Women’s Forum, in Maryland, USA, stating that she was not a fan of gender equality, which she felt limits women. Is there a new Olori about to be unveiled? Days before the former Olori announced her failed marriage, there were speculations that the Ooni had married a new wife, whose name was given as Bolanle. The word out is that Bolanle had always been in the picture. In fact, many people had assumed that she was going to be the Olori before Wuraola snatched the queen’s crown, albeit briefly. Some sources said that Bolanle might be the new Olori. Even though the information about her is still very sketchy, the same source revealed that Bolanle is also fair-skinned like the former Olori. However, Bolanle won’t be the only Olori at the Ooni’s palace; two women are also said to be coming to join the Ooni’s group of wives. One of them is a classy lady who works with one of the big telecommunications companies in the country and the other whose full identity is not yet known is said to live abroad.